With a fog output of 4,000 cfm and a quick heat up time of 1.5 min, this lightweight and compact fog machine creates a smoky atmosphere to enhance any light show. An LED-illuminated tank allows the fluid level to be seen from a distance, while its water-based components won't leave any residue. Conveniently operate Hurricane 901 from a distance with the included wired remote. Lightweight and compact fog machine creates a smokey atmosphere which enhances any light show. LED illuminated tank allows the fluid level to be seen from a distance. Quick heat up time ensures the machine is ready to go with a few minutes. Water-based components won't leave any residue. Includes wired remote to operate the machine from a distance. Tank capacity: 0.3 gal (1.3 l). Remote length: 15 ft (4.6 m). Heat-up time: 1.5 min. Output: 4,000 cfm. Fluid consumption: 11 ml/min. Input voltage: 120 VAC 60 Hz. Power and current: 670 W, 5.6 A @ 120 V 60 Hz. Power and current: 670 W, 2.9 A @ 230 V 50 Hz. Weight: 7.7 lbs (3.5 kg). Size: 10.4 x 8.7 x 9.1 in (264 x 221 x 231 mm). 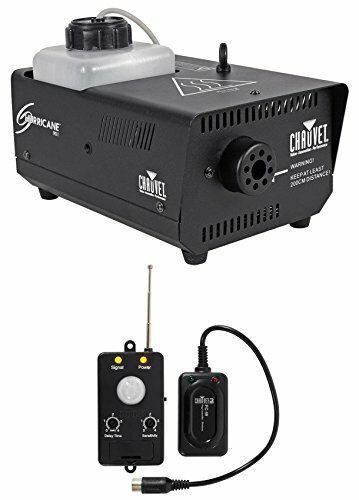 Chauvet DJ WMS Wireless Rechargeable Transmitter Motion Sensor For Fog Machines. Wireless transmitter that automatically triggers compatible foggers with motion activation. Magnet or screw holes allowing the sensor to be mounted anywhere. Built-in delay time and sensitivity knobs offer excellent customization and control. Front-facing battery compartment allows quick battery changes. Built-in dip switches allow the control of multiple units in the same area.. Compatible Machines: Hurricane 901, Hurricane 1000, Hurricane 1200, Hurricane 1301, Hurricane 1400, Hurricane 1600, Hurricane 1800 Flex, Geyser P4, Geyser P6, Funfetti Shot and Snow Machine (SM-250). Includes warranty card and quick reference guide. Max Unobstructed Distance: 100 ft (30.5 m). Operating Frequency: 433 MHz. Input Voltage: 12 VDC lithium battery (A 23). Weight: 0.2 lb (0.1 kg). Size: (transmitter): 4.4 x 2.1 x 1.4 in (112 x 53.6 x 36.1 mm) ; (receiver): 4.7 x 2.6 x 1.6 in (120 x 66 x 41 mm). Max Sensor Distance: 13ft (4 m).